As I have stated before I am not able to distinguish between S. longipes and S trapezia but I am gambling the one above is the latter. 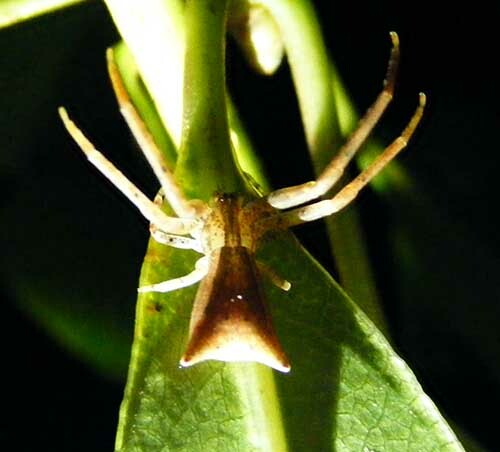 Although this was a nocturnal image the spider was probably asleep on its leaf. 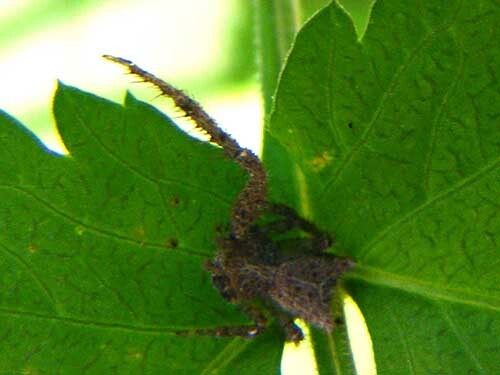 These triangular crab spiders are very common all up and down the east coast of Australia and in New Zealand. This spider (Sidymella hirsute) did not appear to be in any images until they were blown up in the computer. Consequently there was no effort to get the clear shot and this is all there is. Hirsute mean hairy and you can see the spines and hairs on its legs. To me at the time it looked like some sort of dead thing. It did not move and it looked like it was covered with fungus.